Dust the board with little bit of all purpose flour and spread the puff pastry sheet, it prevents from sticking to the board. One pastry sheet will have 3 columns, so cut into 9 pieces by splitting the column first and then rows. You would finally get 9 squares. Meanwhile, in a pan heat oil, add onions, green chilies and saute till the onions become transperant. Add ginger garlic paste and saute for another minute. Add capiscum, corn kernels, red chili powder, turmeric powder and curry powder. Mix nicely. Cover and cook for 10 minutes. Do not forget to stir often to prevent it from burning. Remove from heat and keep aside to cool. This is the filling. Using a spoon, scoop in enough filling in each of the pastry sheet squares and fold in a desired shape (rectangle or triangle). Close the edges carefully with hand or you can use a fork to give it a nice edged shape. Prepare egg wash by whisking a egg with about 1 tbsp water. Preheat the oven to 400 °F. 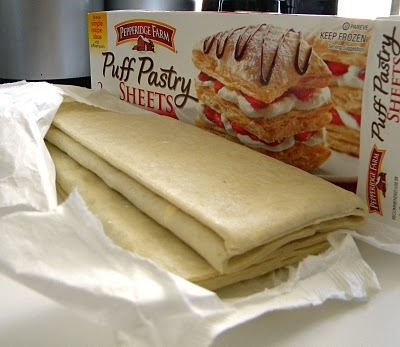 Place the sealed puffs in a baking sheet, lined with aluminum foil. Brush eggs wash on the top of each puff, and bake for 10 minutes at 400 °F or until they become nice golden in color. Once the puffs are out of the oven, transfer them to a cooling rack and allow them to rest and cool down for 5 minutes. Serve warm with or without ketchup. *The filling for the puffs is very flexible. 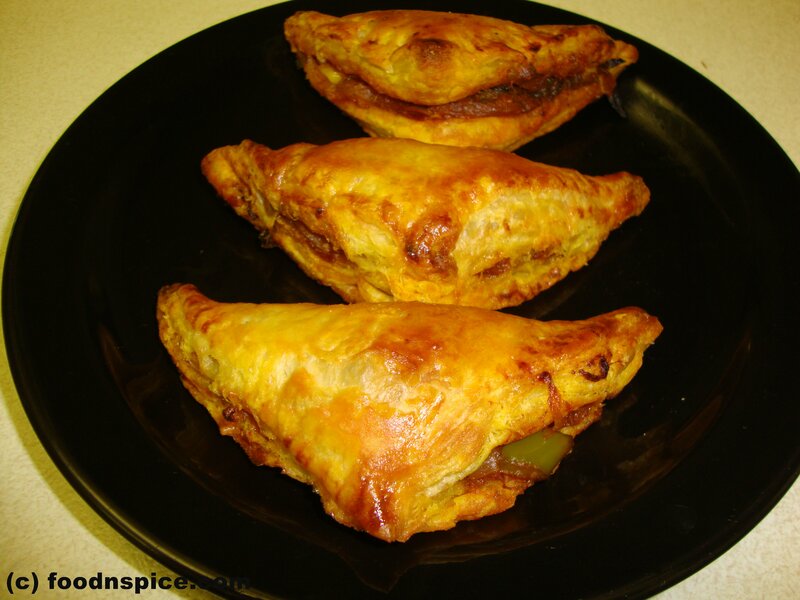 Use any vegetable,meat and spice combination for the Puffs. *Do not over fill the pastry as you will not be able to close the edges. *The egg wash gives the puffs, a nice glazed look and color. If you don’t eat egg, you can use milk instead of the egg wash.